I planned to go on my next trip, to South America on Oct 5 2002. I had an airline reservation for Quito, Ecuador. I planned to go around the entire S. American continent in four months. It was supposed to be a great trip. The most challenging part was to cross the enormous Amazon basin from Brasilia (the capitol of Brasilia) to Manaus, a city on the Amazon river, see attachment. There are no functioning roads there. A plan of my trip was already written, edited and prepared to be sent to you. But . But something happened which interrupted my plans. I always wanted to share my experiences with you in hopes that my experience will be useful to you. These who read my notes from my previous trips may remember the priceless advise on how to eat glass, ride Mediterranean ships without tickets and how to iron clothes without an iron. Now, I will share with you another experience which may be even more useful. When we finished conversation, I reminded the doctor about my stomach pain and he sent me for a CAT Scan of the abdomen. I should thank my doctor for his generosity. I knew some people who also wanted to have some procedures, like X-Ray or CAT Scan to be done, but doctors refused, afraid of being condemned for prescribing unnecessary procedures. When these procedures were eventually done, it was too late. My last supervisor died this way. After the CAT Scan my doctor called me again and told that I have a stone in my right kidney and something else, hopefully nothing serious in the left one. He advised me to see a urologist. The urologist, whom he recommended was busy till the end of November, but my trip to S. America was supposed to start in less then two weeks. So I found in the Yellow Pages a doctor who has an appointment for the next day (Sept 24) and went to him to clarify what is in my kidneys as soon as possible before departure to S. America. He said, "the kidney stones are no big deal, let me brake it with shock waves and in two weeks you can go to S. America." He sent me to an additional CAT scan to exclude the possibility of cancer in my left kidney the next day, and scheduled an operation of stone removal on the day after, Sept 26. I called him several times to find out what is in my left kidney, but the secretary told me he was busy. When I reached him eventually he told me that he will explain the condition of my left kidney tomorrow at the hospital. When I was on the stretcher, ready to go to the operation room for my stone removal, the doctor eventually arrived. I asked him: "What is in my left kidney?" In the left kidney, he said, you have CANCER and pushed my bed to the operation room. Operation was done in less than 48 hours after my first visit. Now, 18 days later, and after many hours spent on the Internet, I understood that it was no need for such rush at all. Even more, it would be much better not to rush, but investigate my newly found cancer, and plan the best way to deal with both the stone and cancer. The only rational for such rush, I think, was the doctor's concern that I may change my mind and do not go to the operation. Then he will loose his revenue. It looks pretty obvious for me now. Why did I agree for the operation to be done in a such rush? Why I did not jump out of the stretcher and run out of the hospital? The reason is inside my soul. Like many people who emigrated to America from the Soviet Union later in their life, I have some leftovers of Soviet mentality (sovokovoi) deep in my mind. My first reaction is not to challenge the decision made by the doctor, one of these noble people who devotes their lives to helping others. I have a deep seeded authority obeying complex. It is difficult for me to interrupt the smooth functioning of such an important institution as a hospital just for my own self-centered interests. Mainly it is my "queue" mentality. I am one of many these little guys (vintikov) standing in line and I should not interrupt the smooth line operation. Well, anyhow, the operation was done and now instead of one round good looking stone, 15 mm in diameter (see picture in attachment), I have a bunch of gravel stocked in my ureter (tube connecting kidney and bladder). A cancer diagnosis is a shocking experience for everybody. I was shocked too. But, for comparison, I was shocked much more when I was laid-off from my last job at Hunterlab Inc. in 1998. Why so? Many people whom I knew well, died in the past few years. I had enough time to think about life and death situations. Also I am a Buddhist, a little bit. These who read my Notes from Tibet http://www.poxod.com/hotline/bike/mumzhiu/11_17_2000.htm may remember how I discovered that I always was a Buddhist, even without knowing this. And Buddhists look at world philosophically. Interestingly enough, the main circumstance which allows me to look at the potential death threat quietly, was the fact that I have already seen the World, at least a considerable part of it. To see the world was my ultimate goal in life. I wanted to see the world more then to have a good car or a nice home; more than to have a million dollars. Now, my lay-off, 4.5 years ago, looks like blessing. If I had not been laid-off, at that time, I probably would continue to work till now, and did not see all these places from which I sent you my Travel Notes. If I would have been diagnosed with cancer in such a situation, then I would really be very unhappy. Fear of death is a normal part of human psychology. But it is possible to suppress or manage these feelings with proper training. I always preferred risky kinds of sports like white water rafting, mountain skiing and mountain climbing. Also, I did sky diving, bungee jumping and paragliding. And now this training paid off. I went through bone scan and chest scan for metastasizes on Oct 4 and I did not lose my sleep or appetite and quietly waited for four business days plus a weekend until the results were ready. The results are good. No metastasizes!!!! I will keep you updated on my medical and travel plans. PS: There are some good things about being diagnosed with cancer, too. Usually I watch with some pain how the Dow Jones Industrial falls every day and evaporates the leftovers of my 401 plan invested in hi tech stocks. Now I don't care. PPS: Oct 13 2002 All the sand and stones stacked in my ureter went out at once, almost clogging my home plumbing system. Thank you very much for your support. I never heardso many good words said about me. It was like attending my own funeral. However, as a Mark Twain said, "rumors of my death are greatly exaggerated." 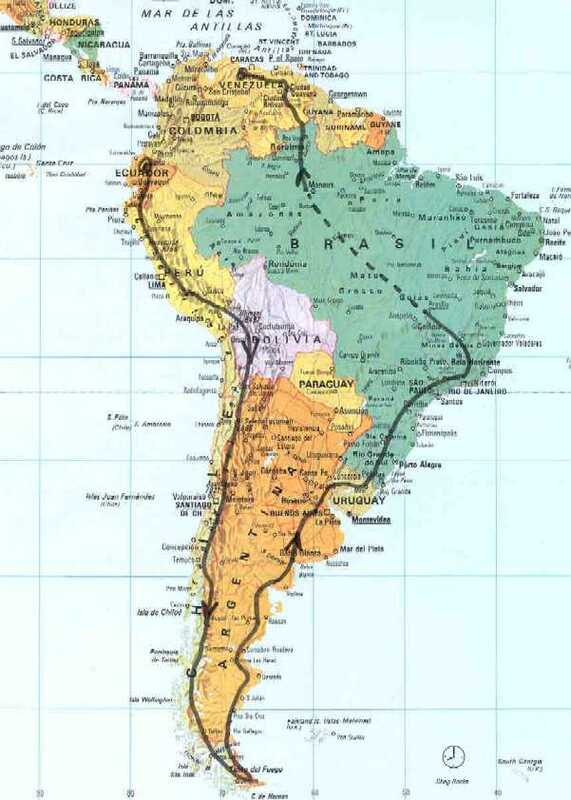 On Nov 2, 2002, I am going to my scheduled trip to South America !!! But let me tell you step by step how I got to this point. In my previous Travel Notes I wrote that my doctor told me that I have cancer only a few minutes before the operation of stone removal begins. Many readers made a conclusion that I had a cancer operation. No, it was a kidney stone removal. It is rather a procedure than an operation. They locate your kidney stone with an X-Ray, then target the stone with the sound wave generator and press a button. Sound waves destroy the kidney stone, but leaves everything else intact. Pretty simple. However this operation cost $10,000 and is fortunately covered by insurance. The story of my cancer, progressed from very scary to much less scary. First I was told that I have a cancer and I was sent to have a chest and bone scan to find out if it had already spread metastasizes or not. No metastasizes was found. My cancer also turned out to be not such a straightforward thing. 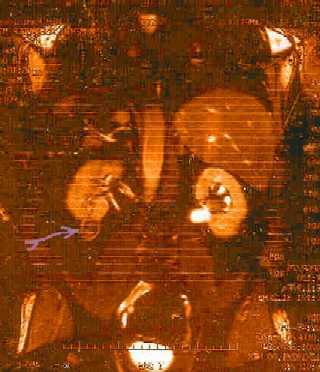 What I have is a cyst hanging down from my kidney. See attached picture. The cyst is a bag filled with harmless liquid. However, there is something unknown on the bottom of this bag. Doctors said it may be cancer, or it may be a hundred dollar bill (AM), nobody knows. Doctors told me that they have a gage (sort of). If the mass is less than 25 mm, then their approach is to wait and see, if it is more they cut it. Mine is 30 mm. But mine is not solid mass, it is mostly cyst. So if it would be only my own decision, I would prefer to wait and see. However, my family has a difficult time watching me walking with the time bomb ticking in my belly, so to say. Because of this, I decided to shorten my trip to South America from 4 months to 2 and have the operation after this. I should wait for 2-3 months until all sand from broken kidney stone will be pissed off. 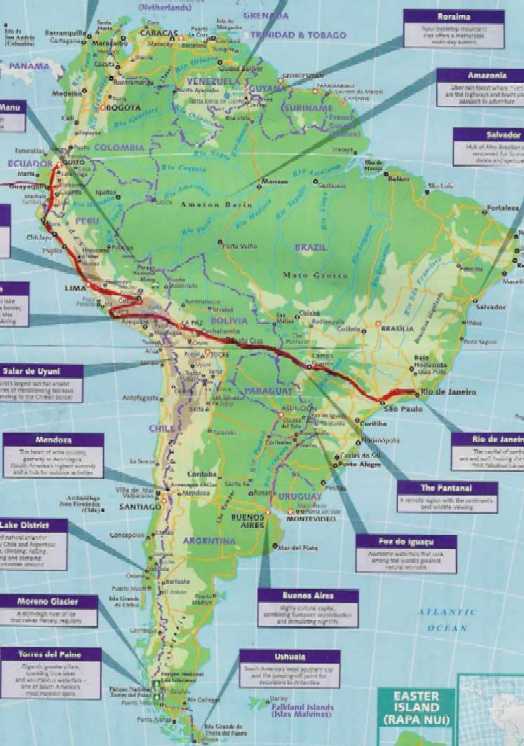 Instead of circling the entire S. American continent, I will circle 3/4 of it; from Ecuador, I will go down to Tierra del Fuego on the Western shore and back along the Eastern shore only to Rio De Janeiro. Amazon basin will be left for another occasion. PS: One of my subscribers, after reading my previous Travel Note quickly went to the doctor, got a CAT Scan and also found a mass in her kidney, a little bit smaller then mine, but she will remove it next week. PPS: Brompton already published my previous Travel Note under the banner "Travel to South America in progress" How did they know that I eventually will go? It took me 13 hours to fly from Washington to Quito. Most of plane was taken by American retires going to Panama for $259.99, 7 days vacation, airfare included. It was intermediate stop at Panama. During my flight I learned everything I should know about Ecuador. Airplane is the best place for study. I learned it long ago while I was working as a consultant for Arthur D. Little consulting Co. Nobody bothers you in the airplane, no telephone calls and no convenient place for the nap. Quito airport is just 10 km from the city so, in spite the late night arrival ( I arrive at 9:30 pm) I decided to ride bike to the city. This is usually one of the most exiting parts of the traveling - arriving at unknown mysterious and sometimes - dangerous city. You should orient yourself, find your way in unfamiliar surrounding and eventually finish in the hotel. These guys who travel with airport-hotel transfer included, missing this part entirely. For me this part is especially attractive because my favorite sport is not football or baseball, my favorite sport is orienteering. I used to participated in orienteering competitions a lot. In America it is known as survivors competition. Streets of Quito were empty, on every corner was military man with kalashnikov and dog. In backpacker's ghetto it was few blocks with people (tourists) in them, bars, discos, Internet cafes (a lot of them) I am writing this letter in Internet cafe with 25 computers and I waited for 20 minutes in line to get place. Everybody is writing Travel Notes. I stay in Hostel International in the middle of this tourist ghetto in 4 bed room ($5). My the only neighbor is black teenager from S. Africa. He came here to study Spanish. I should do it too. Nobody speaks English here. Quito is located on equator at altitude of 3 km so it is pretty cold here. I remember picture of Eqiador from children book situated on both side of Trans America HWY and spotted with working volcanos. It is still this way. This morning nearby volcano was erupting and air is filled with fine volcanic ash. It is like mild version of last day of Pompey. 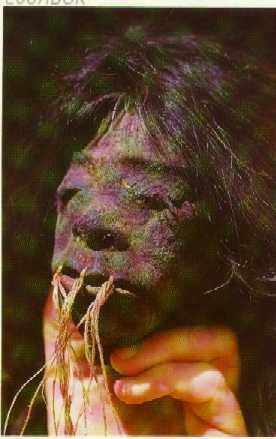 Ash stick in eyes and nose. Many people wear masks. I asked masked polisman where to buy a mask. He obviously do not understand what I want. Suddenly small man jumps in. These who read my notes from Tibet may remember Mr. Pu Pu. It was equadorian version of Mr. Pu Pu. He was very energetic, helpful and fun. We spent rest of day together. Masks were sold at farmacies, by the way. This man, his name is Marko bring me to Internet cafe held by Russians. Equadorian man married Russian woman. They told me that few Russians and Ukrainians find refuge here because none of countries including their own wants to take them. But I am first Russian speaking tourist here. Quito became intolerable. Ash was everywhere. In addition to ash falling from the sky, passing cars raised such a thick cloud of ash that you cannot see the opposite side of the street. This ash is not harmless like Sahara sand. My equadorian friend Marko said that ash is killing his guinea pigs. He keeps guinea pigs not for medical experiments but for food. Many people advised me to try roasted guinea pigs called gye, but I was afraid to insult my young readers. I had a few of them. After expose to ash, you get itchy and have to rush to the shower. Riding a bike would be suicidal here, so I decided to go to the Galapagos Islands. The airport was closed and many bus companies were shut down also. I stayed in a long line and got a ticket to Guayaquil. I got it only for 3pm. Guayaquil is the only other airport which has flights to Galapagos. I was supposed to arrive at Guayaquil at midnight. The only attraction in Guayaqil according tour book is its high crime rate, which scares me. Being a worrier and highly imaginatitive person I easily get scared. The bus ride took 9 hours and cost $9. There were no hotels around the bus station. Taxi driver was very reasonable and nice, he took only $3. I think the worst taxi drivers are in Russia. The hotel which we came to was full, but I managed to persuade an attendant to let me in and sleep on the couch in my own sleeping bag. It was done without any Spanish words. Next morning I rode my bike to the airport. All the flights were filled. However, in the last moment they put me on an airplane to Galapagos. At Galapagos airport, in attempt to escape from pushy tour salesman I took a wrong turn and got lost. Immediately I remembered a story about an Israeli tourist being eaten by iguanas. Eventually I found my way to another island where the main Galapagos town, Puerto Ayora is located. I crossed the island from North to South. It was great. I saw many native Galapagos animals and plants and it was not like in a guided tour. 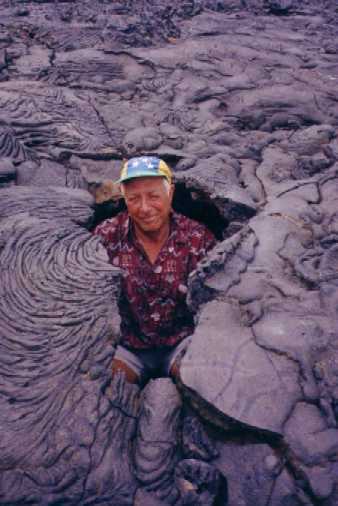 In an attempt to find a restroom I even discovered my own lava tube. Galapagos is known to be tremendously expensive, but hotels are not. I found a hotel for $5, with pretty large room for me and my bicycle. The only disadvantage was no hot water, but the water is pretty warm here anyhow, it is on the equator after all. Everything, like restaurants and bars are expensive here. But local vodka (pretty decent one) as well as onions and bread are pretty cheap. What else does a gentlemen need!? Tours are very expensive here but Lonely Planet suggests doing volunteer work, cleaning rubbish around the islands. It is described in the book as an incredible week of wild life, sea food and rubbish. I applied for it. Tomorrow at 7:45, a somebody from Darwin National Park will come to my hotel to talk about this. So, if you will not hear from me for a week it means that I am sailing on a fisherman boat around the Galapagos Islands and collecting rubbish. Next morning November 7 a driver came to pick me up. I did not take anything with me because I expected to be taken to Charles Darwin Park for instruction and filling papers like desclimer stating that Charles Darwin is not responsible for any injury or death resulting from my volunteering activity. Nothing like this. It is not USA. He brought me right to the Porto, where fishing boat with two teenagers was already waiting for me. I did not know where will we go and for how many days. And it was nobody around who speaks English. Anyhow I decided to go. After two hours we tried to land on NE part of Santa Cruz island. But sea was too rough and we have to jump in the boiling water and swim to the shore. Suddenly I noticed shark fin, nearby then another. Oh my God, I do not have shark powder with me. A moment later I realized that it were sea turtles. Shore was made from volcanic lava fields with its regular features like small craters and sharp pinnacles. You have to jump on them and keep balance. A failing would be terrible. As usual I keep concentrated in such situations and got in trouble only later when I return to normal circumstances. To finish with this, I should tell that I felt for first time when half dead I walk home from the port, and I noticed a nice lady riding bike in miniskirt but did not noticed little step on the pavement. The shore was something from prehistoric times. 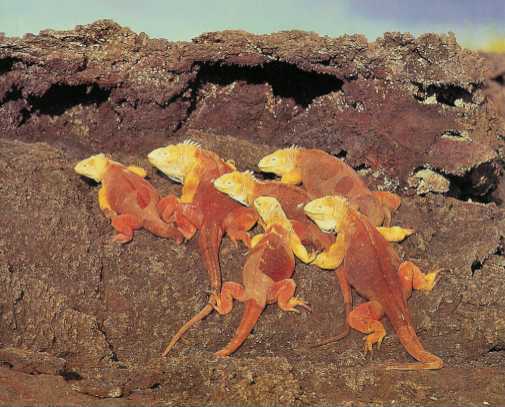 It was inhabited by the large land iguanas and also very large and colorful crabs, painted in very bright red and yellow colors. Iguanas are big, the size of average dog with long tail and furious dragon faces. If you harass them they spit on you like in Speelberg movies. In addition to crabs, iguanas and tortles it was a lot of birds, and I think it was much more interesting when going with tour guide along the marked path for tourists. After we filled 8 large bags boys swim with them to the boat and we headed back to town. To my luck it was cloudy day. Anyhow I was pretty much sun burned and exhausted. But this was unforgettable experience. Thank you very much. I received so many letters in last couple days! Somebody asked me: "Do I feel lonely traveling alone?" Not at all. Thanks to the Internet I have more communications when I travel, when while I sitting at home. One reader who receive my notes through the chain of 3 people wrote: "I am writing to say "Thank you" - you are traveling for a lot of us who are tied for the time being to a more mundane lifestyle." And she added "If you take donations for your excursions, please let me know." Well, it is actually a pretty good idea. One of my major expenses is on Internet, film developing and scanning. Sometimes I try to cut corners on it. With some help from my readers I definitely will not do it, and quality of my Notes will be improved. So these who want to participate please let me know. Another new reader asked where she can read my previous stories. I realized that my plan to circle entire continent is not realistic. Below is the map of my trip as a see it now. My return ticket from Rio De Janeiro is on Jan 20 2002. 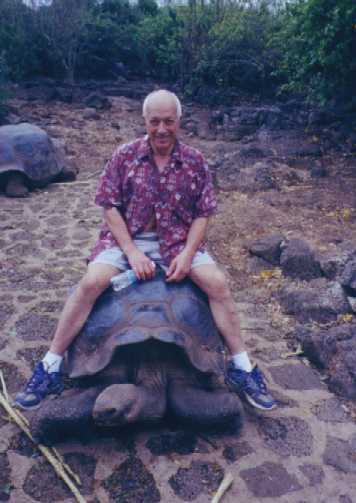 There is no film developing facility at Galapagos so I sent you post cards, when I get to mainland I will sent you picture of me riding this gigantic turtle. Of course I have seen National Geographic movies about Galapagos and read about it, but Galapagos never was on the list of places which I would like to visit. It was too remote, too difficult and too expensive. If it was not for volcanic eruption near Quito and ash fallout, I probably would not have gone there. But I did, and I'm glad that I was there. Galapagos is probably the only place on the Earth where the life is preserved in such a condition in which it was before we (humans) arrived. And I should tell you, it was great on the Earth without us. On one of the uninhabited islands which I visited, the number of animals per square meter was so high that I should watch my step in order to not step on the tail of a prehistoric looking iguana or not to trip over a sleeping sea lion, and gigantic Galapagos tortoises, vow (you will not miss them). 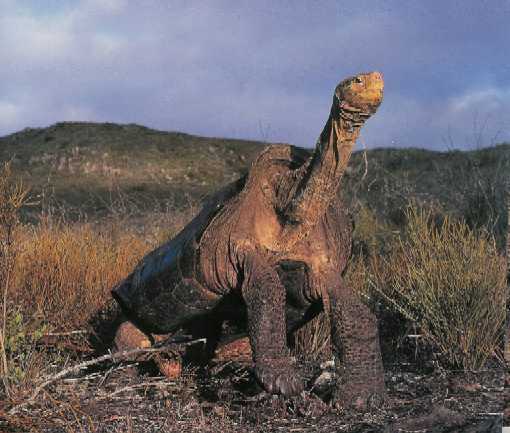 These turtles weight 300 kg. These animals and many nesting birds are not afraid of people, and you can observe their private life very closely. The most admirable are sea lions. You can watch mother-baby interactions and baby lions play from very close distances, just by standing above them. They are such funny creatures. Animal lovers would have a ball here. Sea lions are not shy of people, they actually like people. While I swam, I was approached by sea lions many times. They just wanted to come and say hi. I observed and participated in one episode of human, animal interface, which I would not believe if somebody else told me about it. A young sea lion jumps on our boat (I will tell you later about this boat tour). He definitely came to stay and did not want to go away. Soon somebody noticed that there was something wrong with his or her nose. It looked like a huge needle was sticking out there. The boat captain slowly approached the lion with pliers and after several attempts removed a big nail from the lion´s nose. The animal obviously came to people for help. As a polite guest, the lion spent several more minutes on the boat and then left. As any multi-island place, the Galapagos islands require considerable homework to be done before going there. Most of islands are off limits for individual tourists. Only the groups with an official tour guide are allowed. On some islands only biologists are allowed. On a few islands even biologists are not allowed. There are different kinds of tours and different kinds of boats are available. When you arrive at Galapagos it is too late to make the choices. There are lots of travel agencies there, but they are interested in the sale of their tours, not in educating you. With such a large possible selection, I had to decided first if I wanted to go to a purely scuba diving tour. These tours do not step on the ground at all, and do only diving. The most expensive 14 day tour to Darwin island which cost several thousand dollars per person was completely booked by guess whom-the Russians (probably by new Russians). In order to see if I want multi day diving tour I took one day, 2 dives tour for $110. In professional life people are divided on the narrow specialists and generalists. For all my professional life I was a generalist sitting between on 3 or 4 chairs, so to say, constanly jumping between mechanics, electronics, optics and computers. In my non-professional life I have the same hobbit. So I realized that a multi-day diving trip is not for me. After several attempts to discover the Galapagos on my own, I realized that I have to buy a boat tour. 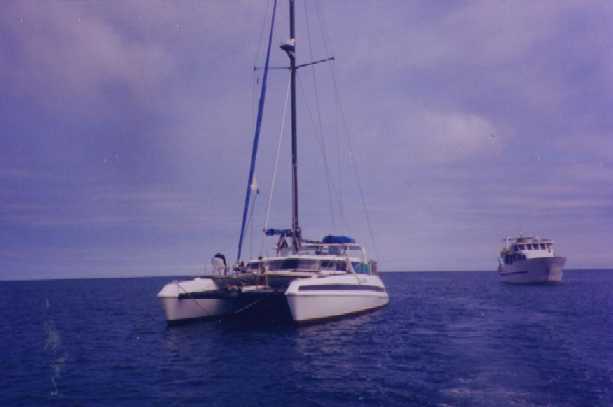 I selected a 4 day tour on a small boat (12 seat catamaran) with scuba equipment and a dive master on the boat for $60 per day, which is a bargain by Galapagos standards. In the last moment I learned that we are leaving in the evening of first day and arriving in the morning of last day, so it was barely 2.5 days. But it was too late to argue and I decided to give up and relax (otdatsia i polychat dovolstvie). The tour was surprisingly good. The boat team was headed by father (capitan) and son (tour guide ) who were very nice and friendly. Food including many local fruits and vegetables was very good. 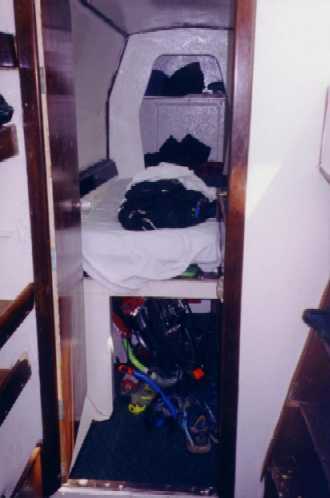 Passengers were 4 European Yuppie couples from Germany, France, Italy and Holland. Two were on their honeymoon. They were young enthusiastic and fun. Our table conversation would be a feist for a polyglot. It started in English, soon it branched in all other major European languages. My choice of a sporty and spartan catamaran was good, by the way. Those who selected more comfortable and expensive boats may end up in a floating nursing home. 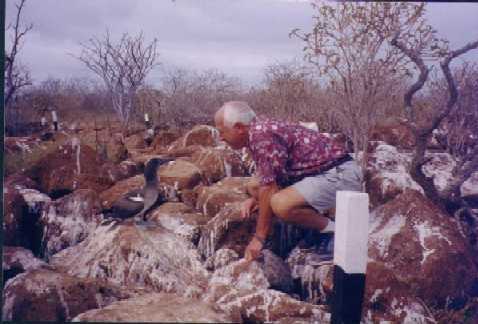 Most of the visitors of Galapagos are very old and barely can move, not to mention make a wet landing. In these 2.5 days of boat tour and one day of rubbish collecting I definitely got an idea of Galapagos, but it would be much better to take 8 (probably 6.5 day) tour offered at Galapagos airport for bargaining price of $450. But it would be not me if I would not try Galapagos on my own and would not try scuba diving here. Scuba diving was good, but snorkeling was the best I ever experienced. There were so many exotic fishes there. I swam with sea lions, sea turtles, sharks and penguins! Some of my readers did not realized how good my day of volunteering and rubbish collection was. We did not collect garbage on the beach, left by tourists. We were brought to an uninhabited shore, far from civilization and rubbish was thrown there from across the Pacific Ocean. Some pieces, which looked like parts of sunken ships were really interesting. I knew that some of my readers are interested in visiting Galapagos. Not in accordance with general opinion, it can be done in a short period of time and is relatively inexpensive. Here are my expenses. 1. Quito volcano ash follout. 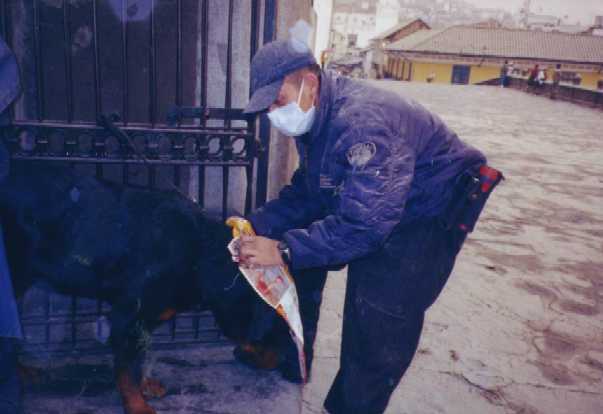 Masked polisman trying to protect his dog with mask made from newspaper. From Galapagos I flew back to Guaquil. Then, took an 8 hours bus ride to Banos, a paradise on Earth. This small cosy town is located near the equator but at an altitude of 1800 meters, so the climate here is mild and pleasant. The town sits inside a deep bowl between lush pictureous mountains. It has 2 hot springs. It is one of these backpacker's paradises which I described you before. Two others were Pokhara in Nepal and Youngshoe in the Guiling province of China. Prices are unbelievably low. A three course dinner is $1.25. I stay in a $2 per night hostel, in my own pretty large and nice room. Hot shower and toilet are across the corridor. I can afford to stay in really luxury hotels for $5, but I prefer to stay in a place popular with backpackers. When you travel alone it is the best way to meet other travelers. Town is surrounded by 5000-6000 m mountains, white water rivers and jungles are nearby. So adventure traveling (aktivnii tourism) is floureshing here. Where is the catch?, cautious readers may ask. No catch, just paradise without a catch. Well, actually, one catch exists. The town is located just below an active volcano. Two years ago vulcanologists gave a red alert warning. Not yellow or orange...red. The president of Ecuador ordered an evacuation of the entire town. Month after month passed and nothing happened. People and tourists returned to the town, but the red alert is still on. The volcano is erupting, sending stones, ashes and gases almost every day, but the wind is blowing it in direction opposite the town of Banos. I went through three mountain bike paths on my own. One from the altitude of 4,500 meters, from mountain climbers refugio at volcano Cotopaxi (5,843m), where I was brought by car. It was snow there. I also wanted to take a jungle trip, but I do not know where is better to do it, here or in Peru or in Bolivia which I will visit later. Does anybody have any suggestions? I met an interesting guy here. He is from the Cayman Islands and is traveling to mysterious and occult places of Central and South America for 7 months and writing a book. He stays longer in Banos and pays by the month, $15 per month. While he has nothing published yet, he presents himself as a writer, which sound very serious. Maybe I should present myself as a writer too, I have something published on Internet at least. Usually on the question "what do you do?" I answer "I do nothing". "I am a writer" sounds much better. As soon as people realize that I am from Washington they ask how did I feel during the sniper attack. Actually, I was not much scared by sniper because at the same time I was diagnosed with cancer. Some readers think it was removed. No, I have the operation scheduled for January 29, 8 days after my return. Few words about Equador. I like the country and like the people. They quiet and friendly and even do not overcharge forigners. Big difference compare with Far and Middle East. They are small and shabby like their favorite food ginny pigs, especially womens looks like them. Native people even smaller and looks like they are lost in this civilization which came to their land without invitation. I should give the title of the best backpacker's paradise to Banos. It is better than two other contenders-Pokhara and Youngshou (I mentioned them in previous TN). It is cleaner, it is not Asia. And people are culturally closer, than Chinese or Nepalese. And it is cheaper. American newspapers are full of sob stories of American would be retirees who lost their pension funds (401k) in volatile market and cannot retire because Social Security (Government retirement support) is not enough. Hey guys, come here. Here, even Russian retiree will survive. In addition, you will be surrounded not by old farts like in retirement communities, but young backpaskers, mountain climbers and white water rafters. However I am leaving this paradise today, or I will run out of time in Peru and Bolivia. Yesterday there was a huge explosions at an Ecuadorean army base in the nearby city, Rio Bamba (pronounced Rio Bomba). With such name it would have happened sooner or later. The PanAmericana highway is closed and the only way South to Peru is through a bad road going through the jungle at the Western Ecuadorean Province Oriente. I probably will cover part of road on bike. 2. 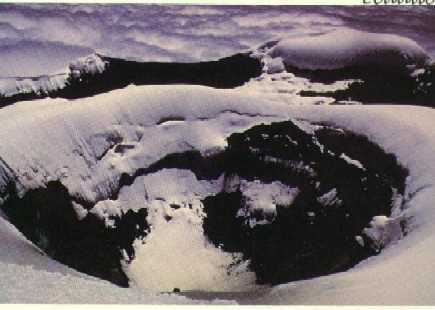 Volcan Cotopaxi 5,875 m. I get to snow line on jeep and went down on bike to Panamerucana and along Panamericana home.